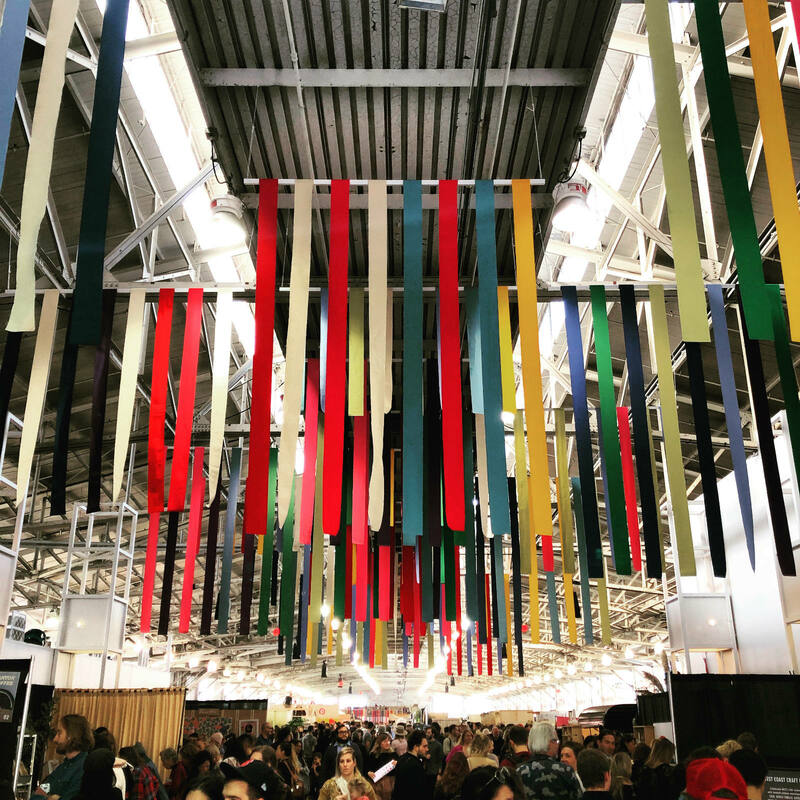 I had to catch myself, sitting on a bench at the front of Fort Mason’s Festival Center during West Coast Craft, mentally noting the two gleeful young women walking past, arms full of shopping bags. Ordinarily I’d have made some cynical comment about these sad, consumeristic creatures, blissfully unaware of their wasteful ways. But then I remembered I had just walked through a holiday market, one of San Francisco’s best, full of actually awesome artists, designers, and other creatives selling their handmade wares. Nothing imported, or very very little anyway. And it was packed with shoppers! They were buying painfully elegant carved wooden bowls, tons of ceramics and tableware, and a surprising amount of clothing and garments, made right here in California. Not that I didn’t grasp the depth of taste and skill in the San Francisco Bay Area (or areas beyond – some came from as far as New York), but I was floored walking through West Coast Craft, at the mostly absent sense of “seen that before.” How refreshing it was. The jewelry did get to be a teeeensy bit monotonous, and there were a lot of ceramics brands present. But I sniffed out some of the best vendors, and thought I’d share them with you here. I regretfully didn’t take many photos, but all these vendors have websites…so you can discover for yourself. I loved this cast concrete bowl in duotone black and white, from Alice Tacheny. I’m not usually a fan of things that look very…DIY? But a friend tipped me off to Eleonor Boström and I have a thing for bowls and other bits of ceramic with face motifs. My mom loved DeSimone, and this reminds me of that style. Plus, this is the perfect little egg cup! I saw “buon natale” on a set of cards at Laura Chautin‘s booth, which I had to have. Her prints and sculptures have a funky, eclectic look and I love the vibrant colors, cheeky holiday themes. Again with the faces, but I laughed aloud on spotting this strange and fun sculpture at Rami Kim‘s spot. That itself is worth a pause. Sarah Wertzberger‘s textiles are vibrant and colorful—FINALLY! I’m so tired of washed out pastels, muted earth tones. Give me some colorrr. I thought this was a very elegant cat play toy, with detachable (magnetic) catnip-filled toy fish attached. Made in San Francisco of hand-painted birch and poplar wood. Unfortunately, also sold out. Crumbs! The Wax Apple table felt like a strange, but somehow cohesive mix of oddities and implements. Like, these body massagers, made of horn and wood. Functional objects = winning. There were many more neat vendors, but these were the ones that stuck out to me. Who knows, one of you might be getting something from this assortment under your tree in a few weeks.